The Asian/Pacific American Librarians Association (APALA) announced the winners of the 2007 Asian/Pacific American Awards for Literature, one of the few ethnic book awards that aren't based on the race of the author but on the content in the book. The prizes promote Asian/Pacific American culture and heritage and are awarded based on literary and artistic merit. The Fire Escape is pleased to present the winners for illustration in children's literature and young adult literature along with the committees' annotations. Crowe, Ellie. Surfer of the Century. Illustrated by Richard Waldrep. New York: Lee and Low, 2007. 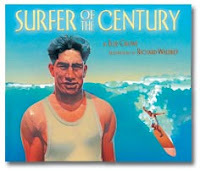 This book tells the story of "the Father of Modern Surfing," Duke Paoa Kahanamoku, from his childhood on Waikiki Beach, to his participation in five Olympics, through his lifelong promotion and development of surfing, and to his becoming the official State of Hawai'i Ambassador of Aloha. Each page of text describing his life has an opposite full-page painting-style illustration that shows the progression of his successes in spite of discrimination and his achievements through his creed of Aloha. The final two pages in the book are a timeline of Duke Kahanamoku's life and legacy and a world map showing the major cities of his lifetime accomplishments. The author includes a bibliography of her sources on the back of the title page. Barasch, Lynne. Hiromi's Hands. New York: Lee and Low, 2007. 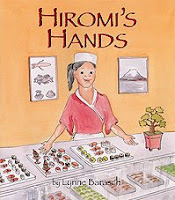 This first-person narrative tells the story of Hiromi's breaking away from the Japanese tradition in the male dominated sushi culinary and becoming an itamae san, professional sushi chef. The author vividly depicts two generations, beginning with her father's long and grueling training as an apprentice before emerging as a successful sushi chef in a Tokyo restaurant. Hiromi is very enthusiastic in learning about fish as she goes to the fish market with her father in New York. At thirteen, she wants to know how to make sushi. Her father, a man receptive to American ideas, says, "And this is America. Girls can do things here that they cannot do in Japan." So begins the sushi career for Hiromi. The story spans two cultures, Japanese and American. The quiet style of narration complemented by the soft ink and watercolor drawings of two fish markets in Tokyo and Manhattan, the New York subway, and an array of sushi convey authenticity. Easton, Kelly. Hiroshima Dreams. New York: Dutton, 2007. Hiroshima Dreams portrays the family dynamics of three generations living under one roof: a grandmother adjusting to life in America, a mother who has let go of her roots, and two sisters, one quiet and shy, the other defiant. The struggles and joys of growing up in an interracial family and coping with loss are important issues in the book. The focus of the story is the relationship between the grandmother, Obaachan, and granddaughter, Lin. Both are resistant to change-Lin to her grandmother's presence at home and her grandmother with her longing for Japan-but they soon find themselves inseparable and share the gift of seeing the future. Obaachan's guidance allows Lin to apply Japanese beliefs and meditation to help her overcome her fears. Through touches of mysticism, careful observation, and reflection, Lin learns to accept and understand the changes and consequences of one's actions. The wisdom of Obaachan is explained with meaningful, descriptive examples that create a sense of calmness and security for Lin. Sheth, Kashmira. Keeping Corner. New York: Hyperion, 2007. Keeping Corner provides an enriching and eye-opening view of the cultural and social dynamics within a family and community in India during the early 20th century. As a daughter in a high-ranking Brahman family, Leela is overindulged and carefree of worries. Married at the age of nine, Leela, now twelve, prepares for her move to her husband's home. Her world is turned upside down when her husband dies, and instead of donning a silk wedding sari, she is given a chidri, a coarse widow's sari. She is confined to her house for a year, thus "keeping corner." Tradition holds her to having a shaved head, no hope of remarrying, and being viewed and shunned as a burden. Leela's growth and her frustrations of being a child-widow is portrayed in a heartfelt and realistic way. She is able to overcome her confinement by continuing her studies, reading, and journaling. The social reform ideologies of Gandhi and Narmad take hold in her heart, and with the help and permission of her family, she is determined to become a voice in society. The imagery and sensory perceptions are told so vividly that it creates in the reader a sense of familiarity and longing to be a part of that time period. Sheth's usage of Indian words flows well, and she provides good, short explanations and a glossary. This is definitely a fascinating read.